By Scott Gilfoid: IBF welterweight champion Kell Brook (33-0, 22 KOs) will be back in the ring making his first defense of his International Boxing Federation 147lb strap in the next four months against an opponent still to be determined. Brook wanted to fight Amir Khan, but that doesn’t seem to be in the cards. Khan wants to fight WBA/WBC welterweight champion Floyd Mayweather Jr, and even if he doesn’t get that fight, which would seem likely, Khan probably won’t be fighting Brook. 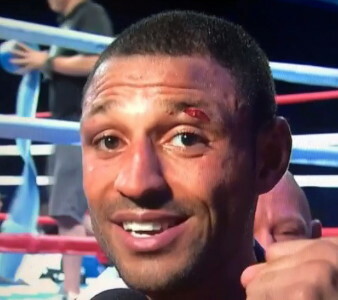 It really doesn’t matter much anyway because Brook’s promoter Eddie Hearn is likely going to go ahead and match Brook against the likes of Josesito Lopez or Andre Berto, two of the names that Hearn had been talking about wanting to put Brook in with for December 6th in Sheffield. Brook won the IBF title last August when he defeated IBF champion Shawn Porter in a clinch-filled fight. It was one of those fights that could have gone either way. Khan saw the fight and head Porter winning, as did I, but enough of the judges were impressed with Brook’s performance to give him a close victory. It was a much closer fight than the recent Paul Smith vs. Arthur Abraham fight, and Hearn is pushing hard to get his fighter Smith a rematch against Abraham. It’s interesting that Hearn isn’t talking about wanting to match Brook back up with Porter to clear up the controversy surrounding their fight, but I guess given that the decision went to Hearn’s fighter, he won’t bother. Brook was stabbed in the leg while he was vacationing in Tenerife. He’s still slowly recovering from the injury. The stabbing cost Brook the December 6th date that he wanted to take. Brook wants to fight Khan, Mayweather Jr or Manny Pacquiao in 2015. I’m not sure that Brook get any of those guys in the ring. The problem that Brook has is he just doesn’t have the name right now to get the bigger name fighters to want to agree to fight him. It doesn’t really matter that Brook holds the IBF welterweight title. The casual boxing fans in the U.S have no clue who he is, so it’s not really worth it for the likes of Mayweather or Pacquiao to fight him until he builds up a name by fighting relevant fighters. I’m not talking about Berto or Josesito Lopez either. I’m talking relevant fighters like Keith Thurman. Brook needs to fight someone like that and not clinch so much, because that was just terrible to watch him holding Porter all night long in their fight last August. Brook has got to prove that he can beat a good fighter without holding them 24/7. Until he does that, I don’t see him getting a fight against one of the stars in the sport.